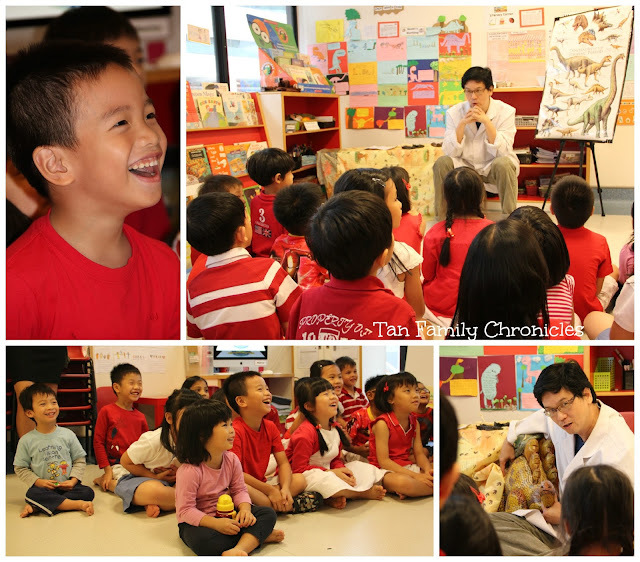 Tan Family Chronicles: Isaac's Dinosaur Mad Science Party! August is traditionally a busy time for us, can you guess why? Yes, that's coz Isaac is an August baby! :) We usually do not hold elaborate birthday celebrations for him. We usually just have a simple cake & goodie bag birthday celebration in school for him, and cake cuttings with the respective grandparents etc. The last time we had a huge party celebration for him was his 1 year old celebration. But even just organising the goodie bags and cakes is enough to make us quite busy already! This year however, is a massive year for Isaac in terms of birthday celebrations. We had just changed the kids childcare a few months ago in May this year, and Isaac took to the transition remarkably well. When we actually asked Isaac "Do you want to celebrate with your old school friends, or your new school friends?" He said "Both!!!" and because he was very accepting of the change in school, we decided to reward him by agreeing to his request! We celebrated on the same day that the school was celebrating National Day! That's why the kids were all decked out in red and white! It was truly a bonus for us that Mad Science Singapore had gotten in touch with us early this year, offering to throw Isaac a Mad Science Party in school this year, for his 6th birthday celebration. So all we had to do was get a cake and settle our own goodie bag. Easy peazy, lemon squeezy! They have many different party themes they can conduct, but the topic chosen for us was an apt one - on Dinosaurs! Isaac has been reading a series of chapter books called Dinosaur Cove in which the two boys (protagonists) get transported to the world of real dinosaurs through a special portal, and has adventures with real live dinosaurs. Isaac has been so taken with this series of adventure books that he has been praying that he can see a real dinosaur when he prays at night before sleep! I told him that that is one wish that is impossible to fulfill, but we can have a dinosaur themed party for him this year. That appeased him somewhat. Phew! So a couple of months before August, I touched based with Mad Science again, to confirm that this was on. I understand they are very popular for their parties, so I wanted to make sure the date was locked in for us! Two days before the party, I suddenly thought to myself "Oh no, what if they forget?" but I needn't have worried, for I received a phone call from the very next day, confirming the party once again. 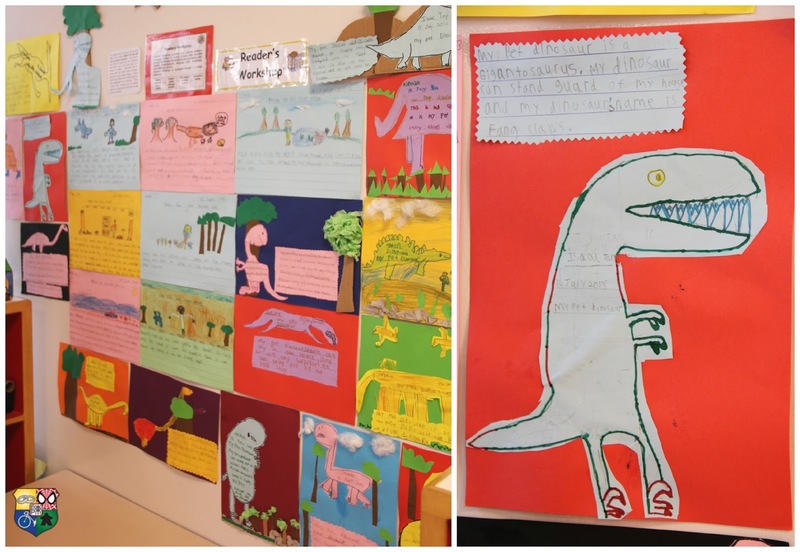 Looking around the classroom walls, I spotted the above collage of the kids' work. Apparently the class also covered the topic of Dinosaurs recently, so this session was very timely indeed! That is Isaac's piece on the right. He wrote:"My pet dinosaur is a Gigantosaurus. My dinosaur can stand guard of my house and my dinosaur's name is Fang Claws"
The Mad Science gang needed about a half hour to prepare and set up. So while we sang the birthday songs (English, Chinese and Malay!) and cut the cake for the kids' tea time snack, the Mad Science team went into the classroom and set up what they needed to, in preparation for the session. The 6 year old K2 class loved it. They listened attentively, enthusiastically raised hands to volunteer answers, and obediently carried out all instructions given to them during practical hands-on parts of the session. Even Asher and Shawna who are 3 and a half years old were very attentive, could follow the programme and enjoyed the entire programme thoroughly. Predictably, however, the kids' favourite bits of the party were the "practical" hands-on parts of it. We had two segments. 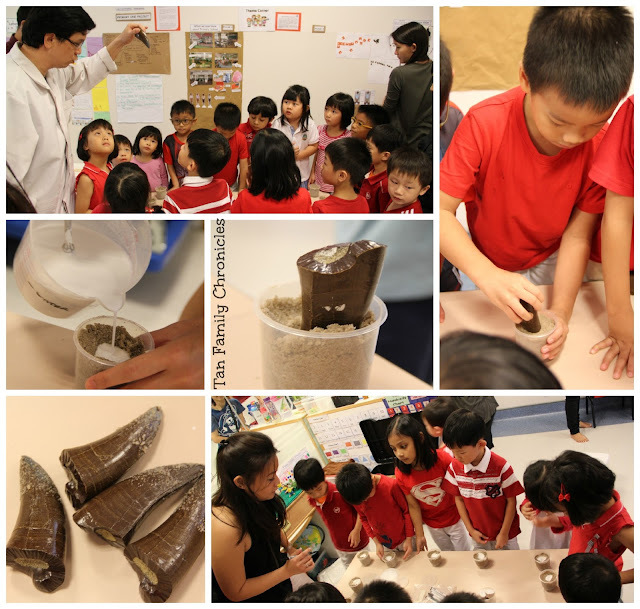 In the first segment (below), the children got to make their own mold of a dinosaur tooth to take home. With all the materials provided for and laid out, the children simply had to insert the plasticky rubber tooth to make an impression in the sand, before the Mad Science crew poured plaster of paris into the holes, and wait for them to set while a second activity was done. 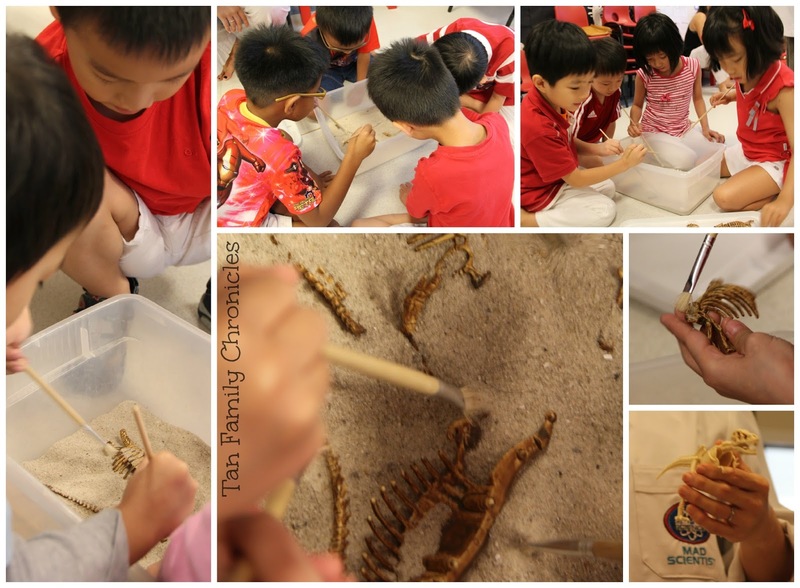 The children positively loved the second activity we had - they got to be paleontologist dusting for dinosaur bones! The kids were split up into groups of four kids where they huddled around a huge plastic container filled with an inch thick of sand, with a dinosaur skeleton in them. Armed with clean paintbrushes, the junior paleontologists embarked on their task with great fervour. All too soon, the party came to an end for the kids. Even hubbs and I were so entertained by the whole session that we too felt a pang of disappointment as the party came to an end. That was how hyped up we were! :) But it was a solid 90 minutes of edu-tainment that was the highlight of the afternoon for all the kids and adults present. The kids got to take home their plaster of paris mold of dinosaur tooth in a plastic container too. I could see them eagerly showing the tooth to their parents when they came to pick them up from the childcare. What a great celebration for Isaac! My dino loving boy would have loved that too :) The pics look so colour coordinated with everyone dressed in red and white. Why is Asher in blue tho? So much fun!!! But it sounds like it's more suitable for those 6 years and up?